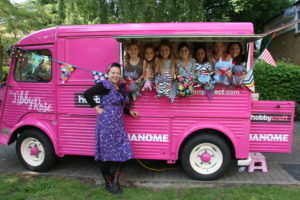 The Pink Bus is a wonderful quirky addition to any Childrens Party or event. 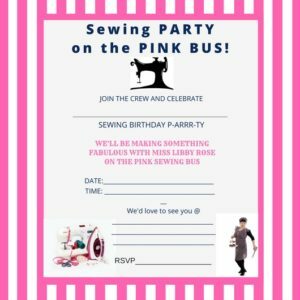 I can fit 8 participants on the pink bus at any one time (6 only at a time if using sewing machines) so it will be in sessions of 8 at a time. There is a pink Marquee to go with the bus so I can offer bigger groups by request. Events at kids parties are based on a 1hr session, all materials are included so I just need a space to pull up and let’s get making! Some ideas for a fabulous Childrens’ Sewing Birthday Party are below with prices. – Funky Bags & Purses – Choose from an array of funky fabrics to make a super cool bag or purse (fully lined) each! This workshop is for participants aged 8 years + and each participant will also take away the pattern and instructions to carry on making at home! Plus I can email you a jpeg of party invites!